Today we will have partly to mostly sunny skies with some afternoon cumulus and isolated thunderstorms over the mountains. Temperatures will be a little cooler than yesterday. Note...yesterday was the first day, this year, that Redding reached 90 degrees. The next closed or cutoff low is already beginning to form. 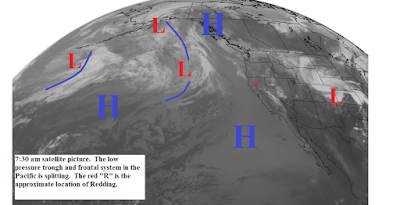 The frontal system moving across the Pacific (see satellite picture below) is beginning to split. The southern end will form a closed low over Northern California on Sunday and then move slowly southeastward Monday (see map below). Sunday we will see more widespread mountain showers and thunderstorms with a chance of thunderstorms over the valley. Monday the showers and thunderstorms will be over the areas east of the valley. Temperatures Sunday and Monday will be normal or a few degrees above. Tuesday and Wednesday the inland areas of Northern California will be partly to mostly sunny with isolated afternoon and evening thunderstorms over the mountains. Temperatures will be above normal. Thursday the next closed low pressure area will be forming off the coast. Movement of these systems is hard to forecast. One forecast models pushes this low near the coast Thursday night and other keeps it off the coast till Saturday. At this time expect the mountain thunderstorms to increase Friday and the weekend. Temperatures Thursday through the weekend look to continue above normal.